I've been all about simple pleasures lately. The days of spending all weekend poring over a recipe are over. My leisurely time in the kitchen has been replaced by food that can be made during naptime or in the short window of happy baby time between eating, sleeping, changing, and errands. 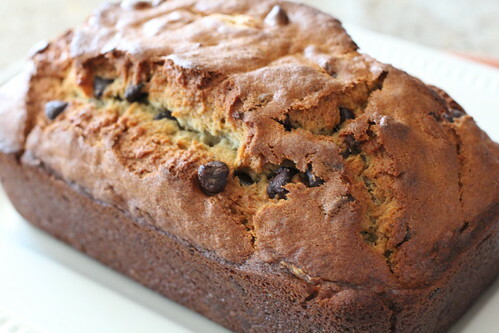 This banana bread is the ultimate simple pleasure. Miss M and I have been visiting my mom in the Midwest for the past week, and she dug up this old family recipe for us to use. It couldn't be easier or tastier, and it made the house smell divine all day. This is one of those recipes that's going to become a staple in our house. We don't have a lot of heirloom recipes in our family, but this is now officially one of the few! 1. Preheat oven to 425F and grease a large loaf pan. Combine all ingredients except chocolate chips and nuts (if using) in a large bowl. Beat with electric mixer until well combined. Stir in chocolate chips and nuts. Pour batter into pan. 2. Bake at 425F for 15 minutes. Reduce heat to 350F and bake for 45 more minutes, or until a knife inserted in the center comes out clean. I'm definitely going to have to give this a try! Looks delicious. My days of elaborate recipes are also on hold. Tried and tested nap-time successes are something I'm desperately seeking!